Rv park was clean clean clean very nice staff. The only negative part was my children and I could not enjoy the amenities Kids must be 18 to enjoy the spa even if accompanied by adults, had a great club house with a pool table but kids must be 14 to play. This is right by my most favorite place in the world. Words cannot explain this enchanted place. Located just outside of Reno , this is where the locals play. With the most beautiful sunny, and sunsets I've ever seen this week is the only lake in the world you can catch lahontan cutthroat trout. October 1st opening day. About 11 dollars a night to tent camp , or bring an r.v. for your glamping experience. The Paiute Native Americans reside here , and I have a wonderful relationship with them volunteering picking up the area in my spare time . This is Americas best kept secret. If you camp here, make sure you leave it clean when departing . Lots to do here. So the desert is the desert, finding a lake there is pretty special. Yes, it looks barren, but it attracts tons of birds and the water sports and fishing are fun. Sunsets are out of this world. This campground is a much nicer experience than the RV park as long as you are prepared to car/tent camp. Bring the boat/water toys. This is a nice jumping off point for checking out the pyramid lake area. Beautiful high desert lake. Note that this is primarily an RV park and that if you are okay camping rough, there is a better campground just north of this place. This campground was one of the nicest I've come across. It's right on the California-nevada state line near Lake Tahoe. In my opinion, this is one of the most beautiful places in the US. A lot of the campsites have a view of the lake. They have sites for tents and RVs. The bathrooms are nice and there's fresh drinking water. There are some public grills to use. Really nice amenities at this place. I personally just love lake Tahoe. Amazing hiking around the lake. Mount Tallac is a killer but gorgeous hike. Go stand on the line between Nevada and California like I did! In the winter this place is awesome too, because the ski resort has some great runs. great hiking trail and camping spot away from civilization. Amazing access to the High Sierra! Awesome spot! Great campground right on a creek, access to high Sierra hiking trails that put you right up at high lakes, and friendly park rangers/station. Rudimentary campsites, no fire rings or tables at any of the campsites. The cement pullouts are still there. I’ve been up in that area a lot in the past three years and the gate that is at the opening is open sometimes and closed and locked at other times. Not really sure what’s going on with the site. On a brighter note the snowflowers were going off earlier this season! There are plenty of sites to choose from on this loop. Two bathrooms and some running water although I believe it is only there for dousing your fire. There is a nice little aspen grove that bisects the campground and every site has a picnic table and a fire ring. You’ll want four wheels drive to get up there, but I’ve seen passenger vehicles make it just drive slow. Clean campsites, Let’s help keep them that way. You are up on a summit so the only thing to cut down the wind if it gets windy is the stand of trees that the campground is situated in. There are pit toilets and water hydrants. I think that there are 14 campsites in all. I went on a Monday durning Peak season. There were at least five sites to choose from. Picnic tables and fire rings were at every site along with a large flat area for your tent. There are a few hikes nearby so it’s nice to be so close to so many trailheads. Ok - Pretty great spot. Breezed in, set up on the tent only loop, and enjoyed the rest of the night. Twenty five buckeroo seems to be the going rate and I've certainly spent more on less. Flushie toilets, bear lockers, easy access to Reno/Tahoe. Freeway noise noticeable, but not objectionable if you're a city baby like me. The staff is amazing. Incredibly clean, well run, efficient and the coffee was great! The site was roomy and quiet. Unbelievable privacy in the Eastern Sierra! This campground earns 4 stars because of its amazing privacy. First, it's quite an adventurous (read: bumpy) drive to get to it from the nearest paved road. Once you arrive, you'll be amazed at how much space there is between the sites. From most sites, you can scarcely see that there are other campsites around! Yet there are still vault toilets. Lookout is oddly named; it's tucked deeply enough into the forest that it doesn't have much in the way of a view (though in fall, the numerous aspen are undoubtedly stunning). This campground is dog friendly, with no one to enforce leash rules (if there are any). Since the separation between sites is so large, this doesn't seem to be much of an issue. Down off the mountain, both human and pooch alike can splash around in the Truckee River to cool off. There's excellent swimming right by the bridge. This is a very pretty lake. it was a little muddy along the shore but the rock area is a great swimming area. unfortunately it is a little dirty with broken glass. The campground though was fairly clean. Vault toilets, but very clean and tons of spots that run right along the shore. my only issue was that it was kind of a loud campground. People playing music from their boats on the water and multiple groups up late (midnight) and being loud and shouting. 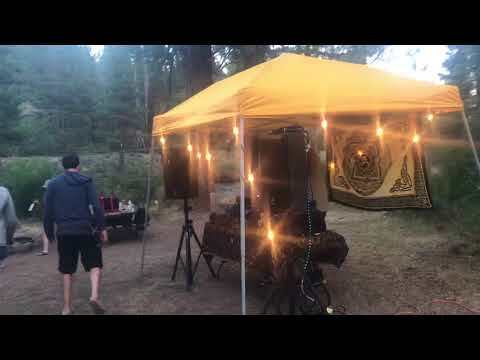 If you like to camp and be loud and have a good time then this is a great place big if you enjoy more solitude and nature, this may not be your cup of tea. Great central location with lots of wildlife and amenities. Like a Norman Rockwell painting. The lake is an iconic alpine lake nestled in the Sierra Nevada’s. Sugar pine and Lodgepole pines dot the campgrounds and birds are plentiful. There are giant pine cones scattered everywhere and woodpeckers can be heard throughout the morning. This is a great spot for families or folks looking for something right on the lake. There is a somewhat wind sheltered creek with picnic spots available that is great for kids or beginner paddleboarders who need to get started out of the wind. Along the lakeshore there are beautiful old wood stoves for cooking. It gets crowded and the dog friendliness is marginal. The lake is slightly chilly but a great swim on a hot day. The campground has bathrooms and there is a visitor center with a museum and gift shop. Reservations fill up in the summer, for weekends especially. This is a small hidden little gem of a campground. They have flush toilets and bear boxes which makes it nice for those of us that tent camp. Close to the water and sites have plenty of space. Ccampgrounds are big, clean and quiet. It was very nice here. Beautiful campsite. Trees were pretty bare so not a lot of privacy from neighbors but a very spacious site. The campground is off of the main road so you could hear cars and motorcycles driving by. However, you have lake “beach” access and it’s a perfect spot to post up for a beach day! Family, right at the water! This was a really comfortable campsite! Bathrooms were single person with lights and a mirror! Lot's of families camping, but we were a group of 4 college age students and it was just fine for us. The families were respectful and seemed to be knowledgeable campers. BEST part about the campsite is that it's a 2-5 min walk (depending where your site is) from the lake!! Lake has the CLEAREST water, and if you go out 5 boueys to the left from the bouey furthest right right, you can see "TAHOE" spelled out on the floor of the lake with big rocks. Pretty cool. Washoe lake isn’t the prettiest, but it’s a nice get away if you live close and want to escape the city for the weekend, very cheap and very nice camp ground. Beautiful area with an even prettier lake! Lots of young people out late and having fun, suggest going when there isn’t a major Holiday so it’s more peaceful. We love this campground in south Tahoe by Emerald Bay! We have come every summer for the last five years with my growing family. This year it was colder in June, but we still swam in the icy water. This campground has beach lake access and the views are spectacular. There are accessible hiking trails on the premises and easy to drive to trail heads, which you can get to before the other summer visitors get there. We usually bring our rafts and hang at the beach all day and go back to our site and relax. Beautiful & breathtaking views. Nice camp host of 10 years + showed us the petroglyphs. Rustic camping. Superb hiking trails well worth the visit. Visited in 2016. Granite Flat is a great way to get out and camp without worrying too much about forgetting something. Now, I know no one WANTS to head back into town for the ice, eggs, or brew they forgot. But if you do, you're only 2 miles from the grocery store. 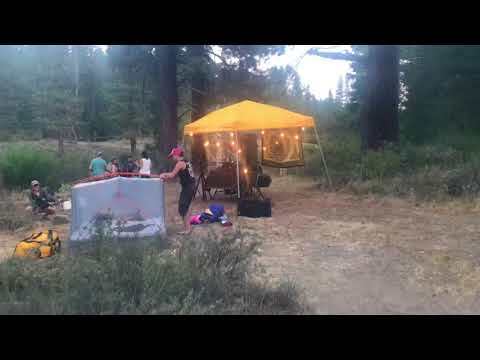 This campground is right along the Truckee river! It is RV/Camper, tent & dog friendly. Though there are very few "tent only" sites. One negative to this campground is that the highway is right next to it. The Tahoe region is EXTREMELY popular so I'd suggest booking early if you can (though it seems you can find sites last min too) and know that if you're next to the highway, you'll hear cars/trucks passing through. By no means did any of my party feel that the vehicle noise was intrusive on our experience though. But it's food for thought. Lastly, again you're near town and can head into Truckee for some tasty brew and food at many local breweries, breakfast, & BBQ spots! Plus the town of Truckee is super cute and should be explored of you haven't been.